Cryptocurrencies have suffered a blow with Bitcoin dropping temporarily below $500. All top three digital coins need to cling onto support lines in order to consolidate and resume the rally. Here are the levels to watch according to the Confluence Detector. After finding at least seven reasons for the surge, cryptocurrencies consolidated on higher ground and recently suffered a blow. Is this a continuation of the correction or perhaps a worrying change of course? Bitcoin, the grandaddy of cryptocurrencies, has managed to bounce back above $5,000 quite quickly and needs to hold onto $5,019 where we see the convergence of the Simple Moving Average 10-1d, the Pivot Point one-day Support 2, the previous 1h-low, the Bollinger Band 15min-Lower, the Fibonacci 161.8% one-day, the Fibonacci 23.6% one-week, the SMA 10-15m, and others. Further down, additional support awaits at $4,861 where we see the Fibonacci 38.2% one-week and the PP one-day Support 3. The next target is $4,730 where the PP one-month R3 awaits. BTC/USD has its first upside target at $5,228where the confluence of the following levels awaits: the SMA 5-1d, the SMA 100-1h, the BB 15min-Upper, the BB 4h-Middle, and the SMA 10-4h. Further up, the next upside target is $5,355which is the meeting point of the previous weekly high and the Fibonacci 38.2% one-day. 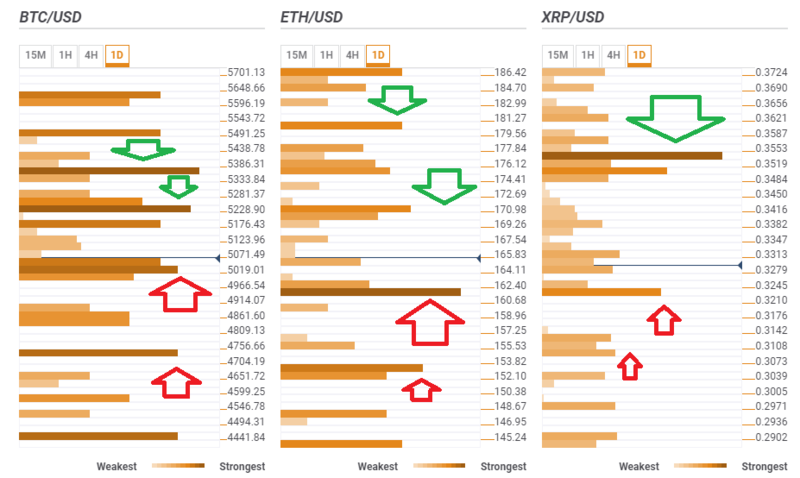 Ethereum has a very clear support line at $161where the previous 4h-low, the PP one-month low, the PP one-day S2, and the BB 1h-Lower converge. Vitalik Buterin’s brainchild’s next support is $153which is a juncture including the SMA 200-1d, the PP one-day, the BB one-day Middle, and the PP one-month Resistance 1. ETH/USD has an initial upside target at $171which is the confluence of the BB 15min-Upper, the Fibonacci 23.6% one-week, the SMA 50-4h, the PP 1d-S1, the previous daily low, and the SMA 50-15m. The next upside target is at $180 where the Fibonacci 38.2% one-day and the previous weekly high converge. Ripple enjoys support, albeit not that strong, at $0.3220 where we see the confluence of the SMA 50-1d, the PP 1w-S1, and the SMA 100-1d. The next support line is even weaker, around $0.3108 which is where the previous weekly low and the Fibonacci 161.8% one-month. Resistance is far but is quite substantial. At $0.3530 we see the convergence of the BB 4h-Middle, the Fibonacci 161.8% one-month, the Fibonacci 61.8% one-day, the Fibonacci 38.2% one-week, and the SMA 504h.